Like most towns or cities, you should have a choice of different soil suppliers to choose from. Sometimes we choose a supplier because of our budget. Other times we choose suppliers for the quality and service they provide. A soil supplier is providing the foundation for a healthy landscaped yard. Just like anything in life, the cheapest supplier may not always have the best quality materials. If you are not aware of the differences in soil quality, you may end up with basic earth, fill, or dirt. This can be lacking in the healthy organic matter required to make your lawn or plants thrive. Be careful with people advertising low prices for so called "Good Topsoil" or "Quality Loam". This may not always be what you are getting. Buying from well known and reputable suppliers is recommended for DIY homeowners. There is usually a small difference in price, but a large difference in quality due to product preparation. Landscaping in Calgary and area offers lots of choices for soil suppliers. We would like to thank a local Calgary landscaping supplies business Soil Kings for allowing us to take pictures of their yard and equipment. It was a pleasure to visit them, we hope this is information is helpful for you too. If you are wondering where your soil comes from when you order a load, here is a typical explanation of what happens. 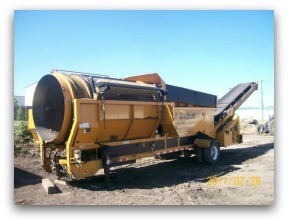 A barrel roller separating larger debris from the topsoil. Most soil is a blend of topsoil and other organics. The topsoil is prepared for blending, in this case using a barrel roller. This barrel roller removes the larger chunks of dirt, clay, rocks and other debris leaving a clean and consistent soil that can be blended with other organic materials. The larger rocks, chunks of clay and other debris are sold, or given away as clean fill. Clean topsoil ready for blending. Quality screened topsoil comes out of the other end of the barrel roller, and is now ready to be mixed with other organic materials. composted organic materials are often added to provide more nutrients. Peat is a moisture retaining additive that is often blended into garden mixes. The type and amount of additives will determine if the soil will be used for lawns or gardens. Some companies will also custom blend soil for you depending on your particular needs. 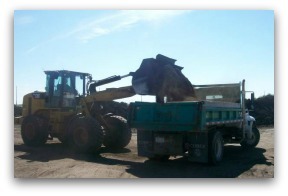 Loader filling dump truck with soil. There is a lot of expensive equipment in a soil operation from the barrel roller, to loaders and trucks. They are all needed every day to provide high quality soils that keep the cities and towns growing. Hopefully, this answers the question of why is "Dirt" so expensive? You can also help to keep costs down and all deliveries on track following these few easy steps. 1 Be there for the delivery time, or mark the spot with an "X" or tarp where you want the soil dropped. 2 Make sure you have considered the weight of the truck and what it will be driving over. You don't want a badly rutted or grooved lawn. It can also damage pavement, driveways, sidewalks, buried utilities, and septic fields. 3 Make sure the box can be lifted in the air without contacting branches, power lines, or eaves. 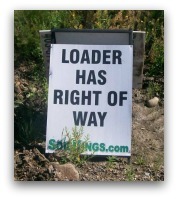 4 Make sure you give accurate directions for an accessible truck route. Make sure you are aware of any weight restrictions or construction that can delay the delivery. When all these things are considered, appointment times can be kept for all, safety is covered, and everyone is happy. The best soil very rarely comes naturally. It is usually a blend of topsoil with other organic materials. This is done at a bulk soil supply operation like this one. Screening equipment at the yard. 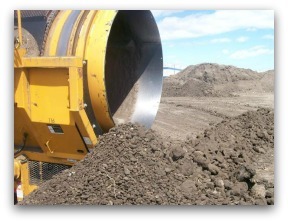 A good bulk soil supplier has specialized machinery to screen and mix these products together to make the blends of soil you need for your projects. They will also have their soil tested, to ensure their customers are getting the best products for their yards. There are important things needed in soil that are not always visible to the naked eye. Landscape companies look for consistency, and will stick to a good bulk soil supplier once they have found one. The good news is that bulk suppliers also retail their products to homeowners like you. Ordering direct from a bulk supplier is usually cheaper than smaller retailers and garden centers. If you are concerned about the quality of soil, go visit them. A reputable supplier will have no problem with you coming to visit their operation. Some suppliers will even let you customize your own blends of soils. When visiting a soil supplier always be aware of moving equipment and never led your kids roam around. Unlike a garden center, this can be a very dangerous place. Main uses of soil for homeowners. Soil purchased for seeding or sodding a lawn (loam, topsoil). Garden and planting blends (peat soil, garden soil, garden loam, potting soil). Basic fill materials (dirt, earth, clean fill). 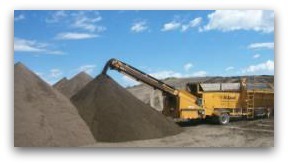 Many bulk soil suppliers will also retail other products like garden mulch, stone, gravel, and decorative rocks. This can be a great way to save money purchasing these materials in large bulk quantities. Now that we have taken a quick stroll through a soil suppliers yard, let's take a little more in depth look at soil and talk about Soil pH Testing.